The anticipation is building for August 17-19th, 2018! 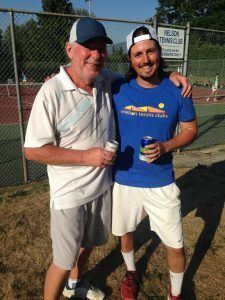 This year’s West Kootenay Open promises to be another great event. Hosted by the Nelson Tennis Club and run by Mr. Tennis himself, Ron Stinson, the WKO is looking to build on the record turnout from last year. Competition will be stiff, but more importantly the drinks will be cold!! Check out the tournament poster below for tournament and registration information.